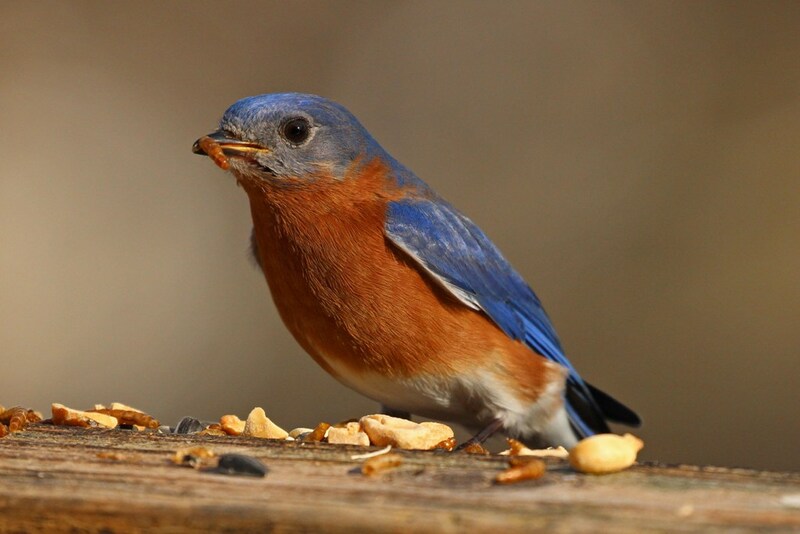 The Eastern Bluebird and the Blue Jay are two year round residents in my backyard, though they show up more often in the winter months to take advantage of the fast free food. 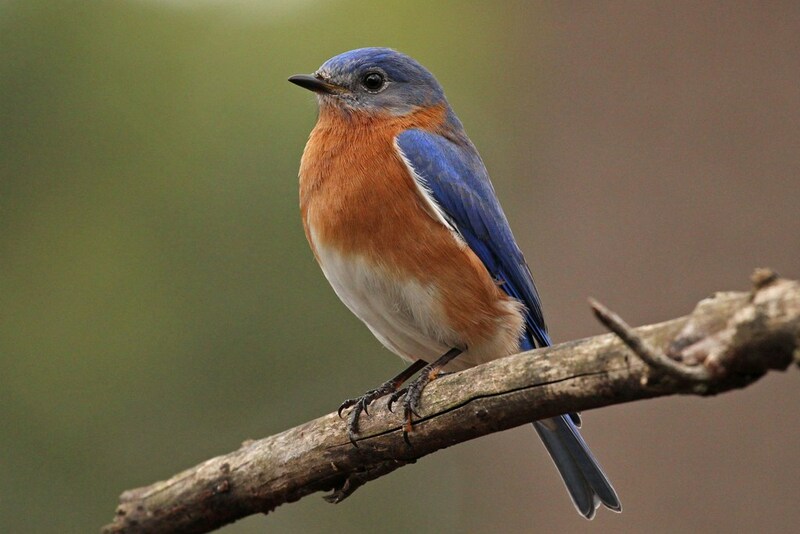 Always a fan favorite, the Bluebird (especially the male) boasts a blue that is breathtaking in its beauty. 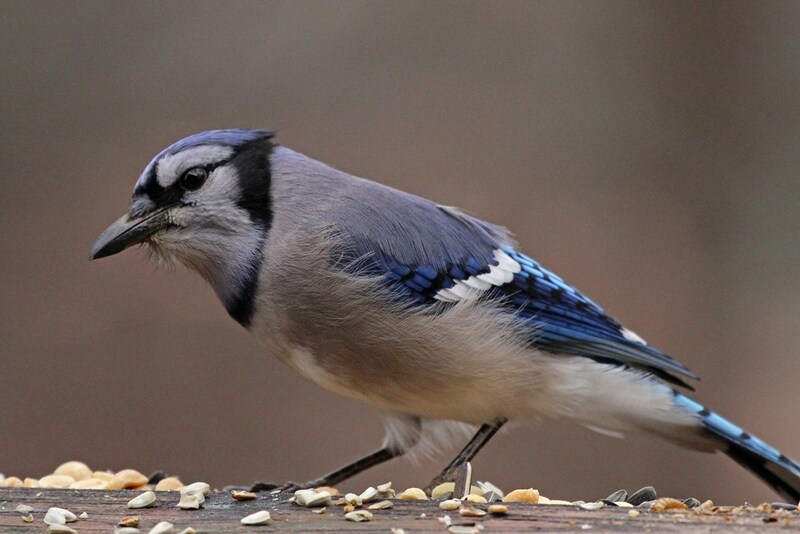 These guys are prolific mealworm munchers, but also eat their fair share of Bark Butter – especially once they have little mouths to feed. 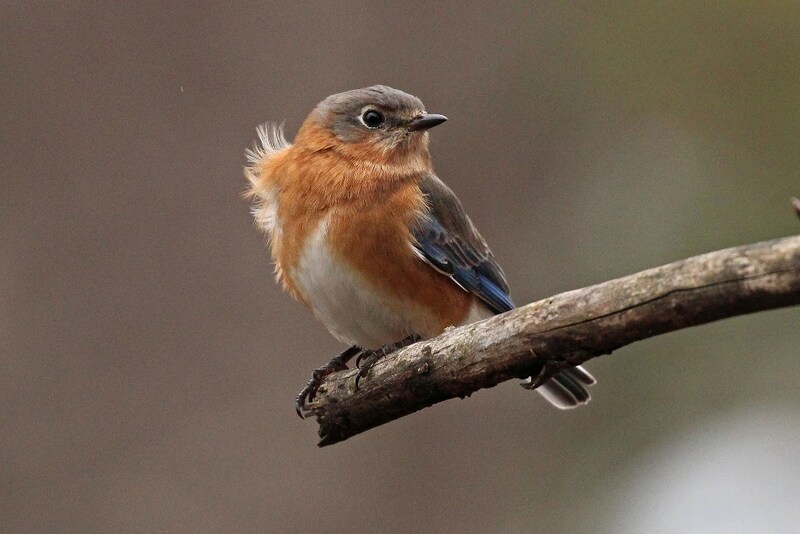 The female’s blues are more subdued, but she is still quite lovely. I am hoping they will have a brood of babies to bring to the feeders in a few months, but for now, I’ll keep enjoying the company of these adults. 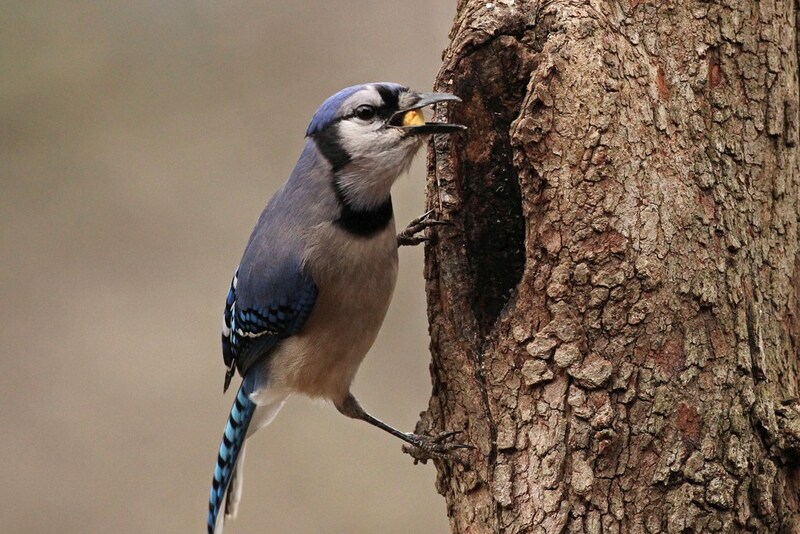 Blue Jays are double the size of Bluebirds and are often thought to be brash and abrasive. Despite their bullyish reputation, I find them to do more squawking than squabbling. Perhaps that’s because there is such a plentiful food supply that there is not much need to fuss and fight. These guys LOVE peanuts and will search them out wherever I hide them. It is always fascinating to watch how many they can pack away in one sitting. How about one final up-close and personal shot? 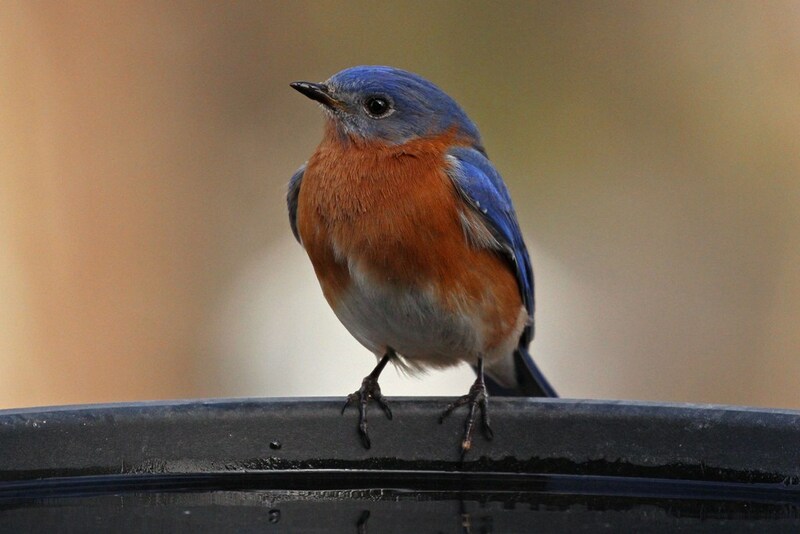 I am grateful for my backyard blues! 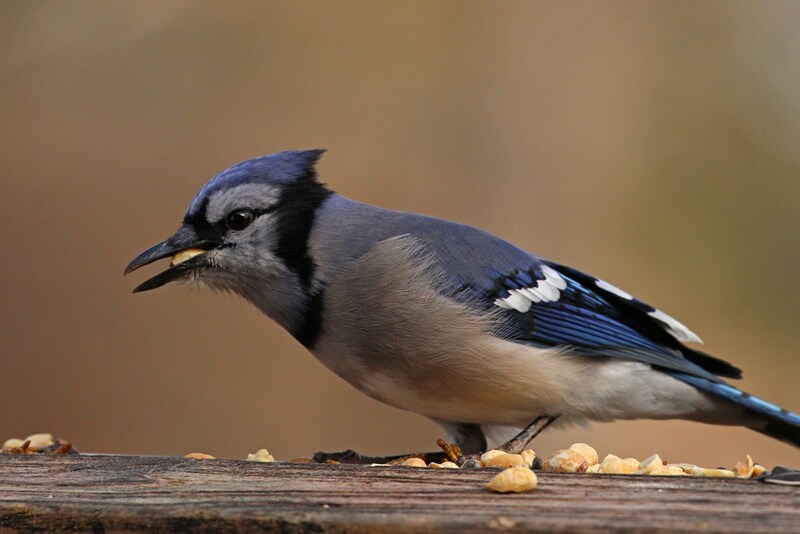 This entry was posted in Backyard Birds and tagged bird feeding, bird photography, blue jays, bluebirds, georgia birds, hobbies, nature, photography. Bookmark the permalink. You are such a talented photographer, Kathy, and your love and appreciation for these beauties shine through your posts! Thank you! I do love the beauty in my backyard…but I’d love to add some lions and tigers to the mix! And my Labs might not love the idea of adding bigger cats to the mix! Good to know about the peanuts. Thanks. Lovely pictures. 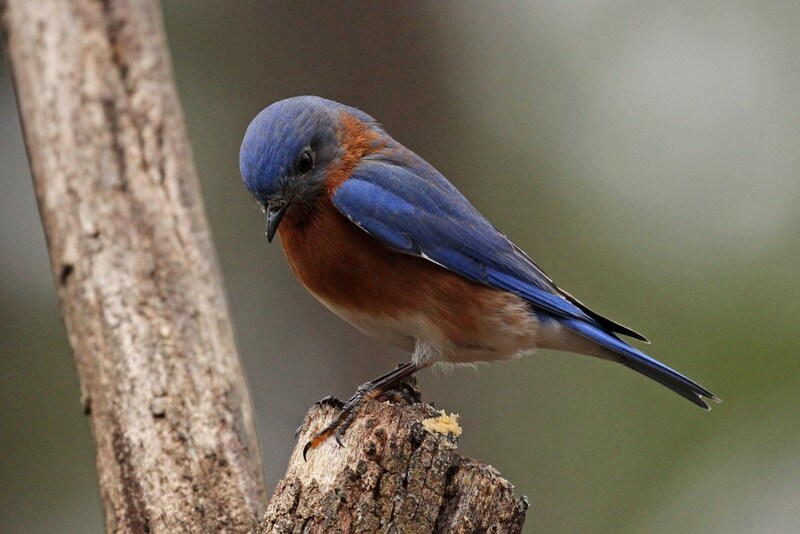 Just gorgeous … both the Bluebirds and the Bluejay. 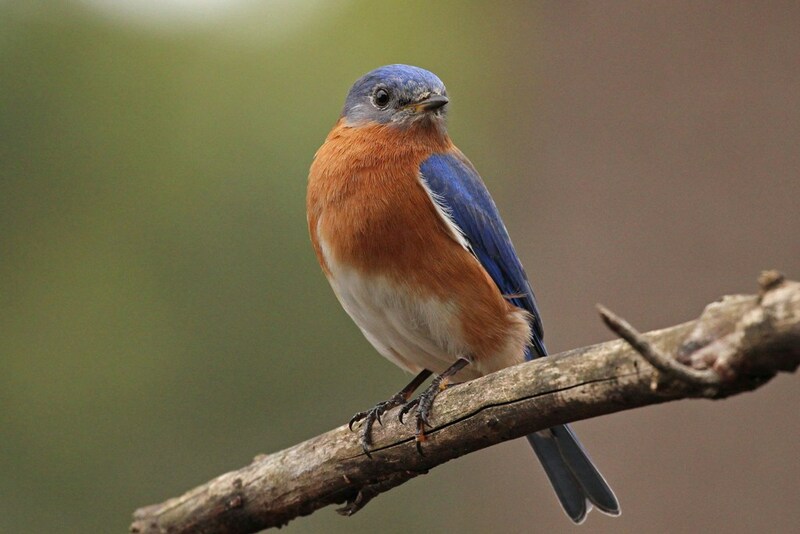 I’ve never seen Bluebirds around here – I liked seeing the up close photos of them, just like the Blue Jay. 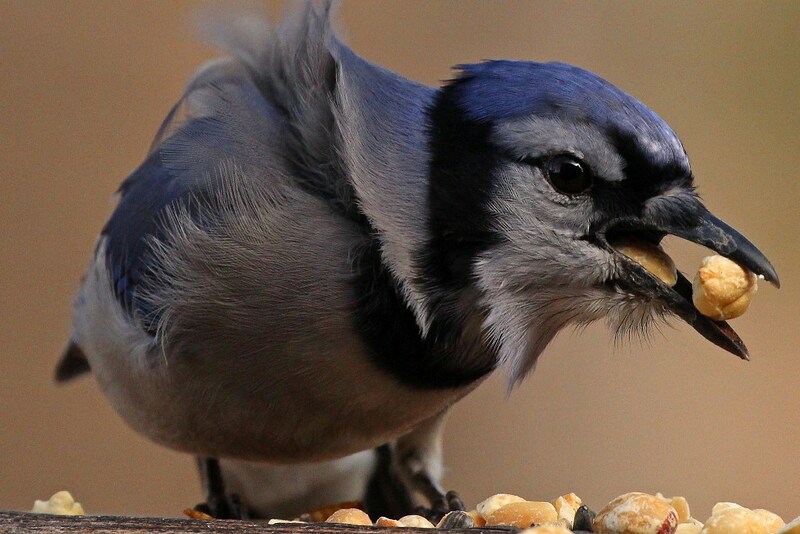 I didn’t realize the Blue Jay had the checkerboard-looking plumage on the back and tail – they flit by so fast, I’ve never noticed it before. 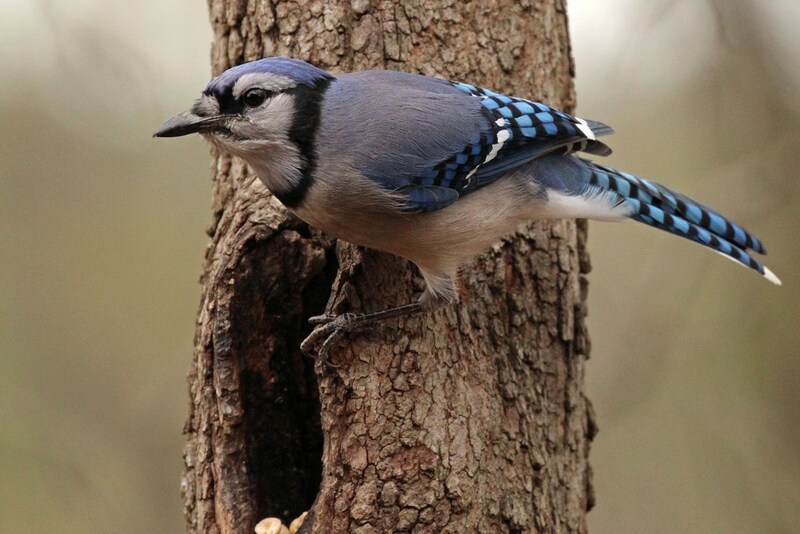 I was amazed with the “checkerboard” detail on the tail/back portion of the Jay and we’ve had them here in the neighborhood for decades (except a few years when the West Nile virus hit and we lost many Jays and Cardinals … a sad time for bird lovers). 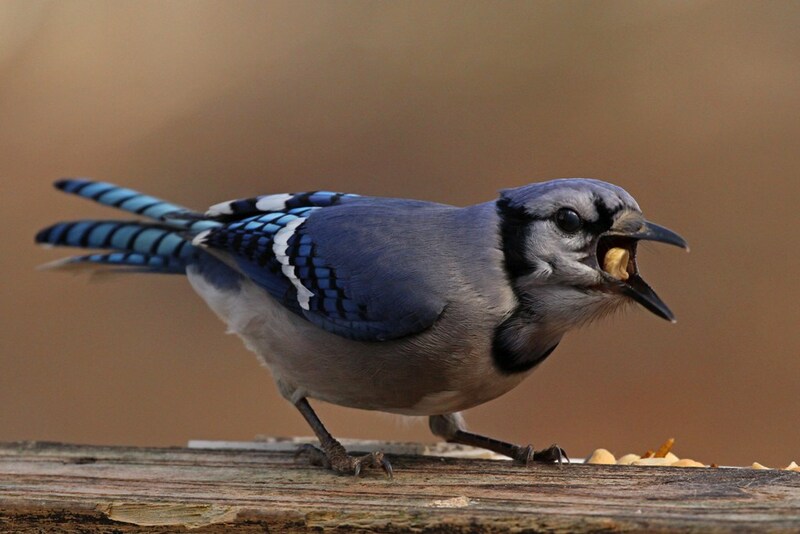 It is funny that you can hide the peanuts and the Blue Jays hunt for them! 😃 Gives new meaning to the game, Hide & Seek! Beautiful shots of the “Blues”! Your photography is just beautiful! I love watching the birds and their colors are so vivid and amazing! Fantastic shots! Wonderful captures! 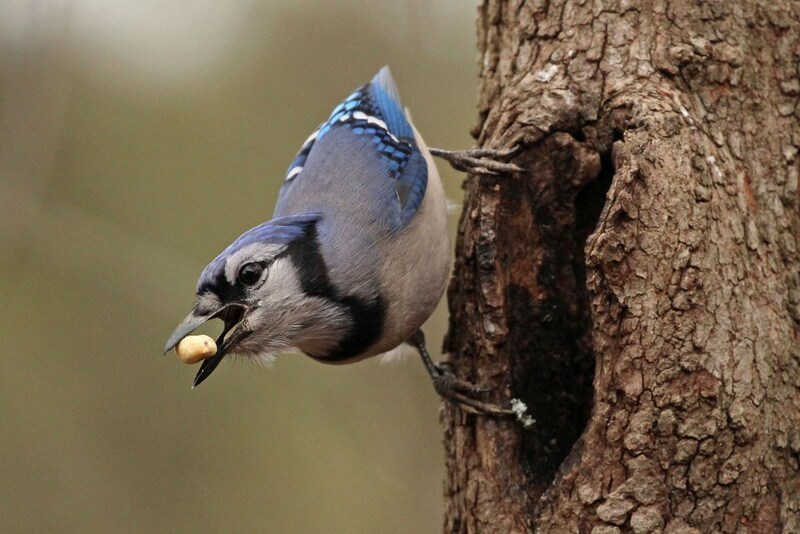 I love that you hide peanuts. How clever!